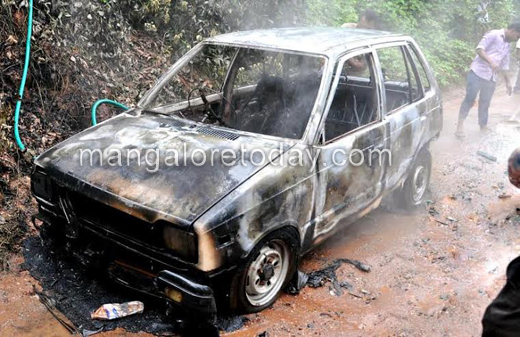 Bantwal, June 14, 2015: The driver had dramatic escape when the Maruthi 800 car, in which he was traveling, caught fire near Bantwal. The car was totally destroyed by fire. The car belonged to farmer Jayant Nayak, from Posavalike in Punancha village. Jayanth was driving his car back home on Friday. Jayanth smelled smoke inside his car. He parked his car for safety. Seconds later the Maruthi 800 became a mass of flame. No casualties were reported in the fire.